Are Vultures Hovering for Howson?? This wasn't Scott Howson's deal to make. It's the long and short of why Rick Nash wasn't trade at the deadline and why Howson won't trade him at the Draft. 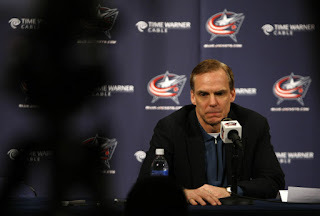 Mostly because I believe that Howson won't be there for the Blue Jackets come Draft time. Fact of the matter is that Howson was in a lose-lose situation. First off, he probably couldn't trade Nash because the price he was asking for return was much to high for teams to pay. Even though Nash is a talent, the odds are that his lack of playoff experience doesn't warrant trading away the chemistry you have on your team, as well as mortgaging the future, even if Nash will be around during his prime with the team. Second, Howson didn't want to hamstring his team he's working for being responsible for trading the face of the franchise, especially if it doesn't work out in the end. Should Howson's tenure end in Columbus and trading the biggest name on his team for what could be nothing won't look good on any resume you'd be showing to prospective employers. Third, and I think most important, Scott Howson is not long for the Columbus Blue Jackets organization and may not have been allowed to actually move Nash, regardless of the price. It's been a bad year for Howson and the decisions added to the lack of solid play could have hamstrung Howson for the long-run. Sure, injuries could be claimed in the case of summer pick-ups James Wisniewski and recently-traded Jeff Carter, but at the same time-- the goaltending wasn't solid, the rest of the team didn't pick up any slack, and the star player was merely a footnote with only 21 goals and 22 assists as the captain of the team. Granted, that stuff is out of Howson's control, but didn't make the team better in the long-run. It almost seems like a lame-duck move for him ask so much or be told to ask for so much by the ownership. Considering he didn't make many other moves of note either, shows that he is probably not in control and come April, he'll be in the unemployment line. Another clue to his demise could be how Howson broke down the fourth wall and threw the star player under the bus and making himself the victim. When you do something like that, you're already breaking down a more fragile situation and maybe it very awkward for players and upper management to believe in you and trust in your decision making. That, to me, put the final nail into the coffin for Howson's tenure. Like always, I'm probably wrong and that the dreaded "Vote of Confidence" that may come is actually geniune and Howson will stay, but his decision making has been fairly suspect and hasn't yield much success for the franchise in the grand scheme of things. If he would have traded Nash, he would have been run out of town by the fans, with him not trading Nash and then putting private matters out to the public, he could be run out by his own peers. While we've had previous AGM's that went into a completely different line of work when it comes to their post playing career-- this week's profile is one that sort of follows that path. Though is career may not be as memorable on the ice, what he's done off the ice has done wonders for the youth of Canada. This week, the profile of Paul Harrison. Harrison started his career playing with the Oshawa Generals in their Junior "A" program and then in their Major Junior programs in the 1973-74 and 1974-75 seasons respectively. The 1975 Draft saw Harrison get selected in the 3rd round, 40th overall by the Minnesota North Stars. The 1975-76 seasons saw Harrison play in six games for the North Stars, going 0-4-1 with them; as well as going 1-1-1 in three games with the AHL's Providence Reds. Harrison stayed in the AHL for the bulk of the 1976-77 season, but playing for the New Haven Nighthawks-- finishing with a 32-17-6 record, then going 2-4 in six playoff games. Harrison would also see time with the North Stars that season, going 0-2-0 in his two games there. The 1977-78 season had Harrison staying with the North Stars full-time, playing in 26 games and compiling a record of 6-16-2. During the summer of 1977, the North Stars traded Harrison to the Toronto Maple Leafs for a draft pick. 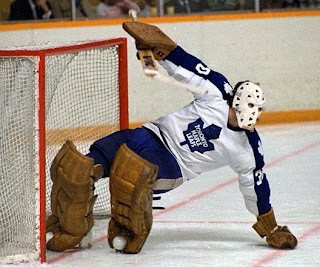 Harrison played the 1977-78 season with the Maple Leafs, appearing in 25 games and finishing with a 8-12-3 record, then going 0-1 in two playoff appearances. Staying as a back-up in the 1978-79 season, Harrison went 9-17-2 in 30 appearances, while being sent back to the AHL with the New Brunswick Hawks for nine games, going 4-3-1 in that span. The 1980-81 season had Harrison with the Leafs' Central League affiliate, Dallas Black Hawks, finishing with a 24-7-2 record, allowing Harrison to get the Terry Sawchuk Trophy for CHL goalie with the fewest goals-against. Harrison also appeared in one playoff game for the Leafs, a no decision. The Leafs would trade Harrison to the Pittsburgh Penguins for future considerations before the 1981-82 season. Harrison played in 13 games for the Penguins, going 3-7-0 before getting plucked off waivers by the Buffalo Sabres, where he would play six games compiling a 2-1-1 record. Harrison stayed in the Sabres organization for the 1982-83 season, playing with the AHL's Rochester Americans for 29 games, going 11-11-3 before finally hanging up his pads. After his career, Harrison took a different path by joining the Ontario Provincial Police in his hometown of Timmins. With the OPP, Harrison was influencial in founding and growing the D.A.R.E program in Canada, which is a program shows elementary school children about the dangers of drug use. Along with the NHL Alumni, Harrison has been instrumental in the Hockey Dream Draw, which is a lottery for people to get a once-in-a-lifetime chance to be part of a NHL team and get the VIP experience to watch many NHL games. Harrison went from stopping pucks to stopping crime to stopping the spread of drug abuse in minors. Which is most rewarding to him is something you'd have to ask him about, but in every step of the way-- he seems proud of each of his accomplishments. With the trade that will bring Jeff Carter back to Mike Richards' side, you have to wonder if this is a smart move to try and get Richards, Carter, and the Kings going offensively. As much as people say that the Carter/Richards combination is poisonous because of their off-ice antics in Philadelphia-- the fact they were two wins away from a Stanley Cup with the Flyers should say more than whatever they did on South Street on any given night. Though at the same time, you think through hockey history and the number of successful reunion moments aren't as memorable as the ones that tank. One of the more famous duds of duos coming back together was Paul Kariya and Teemu Selanne's short tenure in Colorado with the Avalanche. While the two of them were 1-2 in scoring for the Anaheim Mighty Ducks for three of the four full seasons they played together between 1996 and 2000; the trial in Colorado was less than stellar. That 2003-04 season resulted in 36 points for Kariya and 32 points for Selanne. Granted, Kariya only played 51 games that season, the fact that it's a forgetful part of both of their careers shows that you can't trap lightning in a bottle all the time. Looking back at one of the most dynamic combos in the 1980s was that of Wayne Gretzky and Jari Kurri, who put up five 100+ point season when they were on the fire-wagon Oilers, winning four Stanley Cups in the progress. However, when they met up again with the Los Angeles Kings, Gretzky still had his magic, but Kurri seemed to have dropped off, especially with Luc Robitaille coming into his own. Not to say that was a bad reunion, just didn't have the desired results many would have thought. You could almost say the same for Jaromir Jagr and his combination with Martin Straka, but had some success with Robert Lang. Though Jagr ran the Penguins team, Straka was a guy that many thought could play alongside him and make him effective-- which is why the Rangers went out and got Straka after the lockout. Yet, while Jagr succeeded at first and slowly declined-- Straka could never really get going and Michael Nylander would take the running-mate job from Straka. With Lang, he was steady with the Penguins when Jagr was there and stayed steady when the Capitals acquired Lang-- though he wouldn't get much of a chance before Jagr was shipped out of Washington. Dean Lombardi and the Kings had to do something to jump-start their offensively challenged squad because there's only so much Jonathan Quick can do without goal support. Here's hoping it pays off for Carter, Richards, and the Kings-- mostly because those two are in La-La Land until at least the end of the 2019-2020 season, which is when Richards' contract runs out-- and heaven knows there won't be many suitors to take either off of the Kings' hands-- especially when they amount to almost $11M against the Kings' salary cap. Should be fun times-- whether you like watching the Kings becoming an exciting team or just enjoy the comedy of errors that could follow. If there's something always focused on this feature--it's the challenge of getting to the pros. With this week's AGM, he had to go through a couple junior leagues, a couple minor leagues before getting signed to a NHL contract and then all he had to take away from that was a rough injury in warm-ups no less. This week-- the profile of Rich Parent. Parent started his journey first in the BCJHL with the Vernon Lakers in the 1991-92 season, playing in two games (0-1-0) before moving provinces and played 23 games to end that year with the AJHL's Fort McMurray Oil Barons. Parent moved to the WHL in the 1992-93 season with the Spokane Chiefs, playing in 36 games with a 12-14-2 record. In the 1993-94 season, Parent returned to the Oil Barons to play 29 games to end out his amateur career. Undrafted, Parent went into the minor league route, signing with the Muskegon Fury of the Colonial League in the 1994-95 season; going 17-11-3 in 35 games; then going 7-3 in 13 playoff games. Parent returned to the Fury in the 1995-96 season, going 23-7-4 in 36 games-- being named the Colonial League's Most Outstanding Goalie and named to the First All-Star Team. Parent also spent time with the Rochester Americans of the AHL that season, going 0-1-0 in two games, as well as playing in the IHL with the Detroit Vipers, going 16-0-1 in 19 games. In the 1996-97 would play again for the Vipers, playing in 53 games and finishing with a 31-13-4 record, then going 8-3 in the playoffs to take home the Turner Cup for the Vipers. Parent also won the James Norris Trophy for fewest goals-against with Jeff Reese. In the summer of 1997, Parent signed on with the St. Louis Blues, but would only make one relief appearance for the Blues. Parent spent most of the 1997-98 season with the Manitoba Moose of the IHL, going 8-12-2 in 26 games, while also playing for the Vipers, finishing with a 4-0-3 record in seven games. The 1998-99 season saw Parent split time with the Blues for 10 games (4-3-1) and their AHL affiliate Worcester IceCats for 20 games (8-8-2), but the most interesting story was during warm-ups. Parent was struck solidly by an Al MacInnis slapshot, which resulted in a ruptured testicle. In the 1999-2000 season, Parent started off with the Utah Grizzlies, playing in 27 games with a 17-7-3 record, but while he was playing-- Parent was traded to the Tampa Bay Lightning and would play 14 games for them, compiling a 2-7-1 record in 14 games, but would be sent to the IHL, again to the Detroit Vipers, finishing 3-5-1 in 10 games there. Parent was traded twice in the summer of 2000, first to Ottawa and then to Buffalo-- but he would be a free agent at training camp and signed on with the Pittsburgh Penguins for the 2000-01 season. Parent only spent seven games in Pittsburgh, as he would spend the majority of the year with the AHL's Wilkes-Barre/Scranton Penguins, putting up a 17-12-5 record in 35 games, then going 13-8 in the playoffs, losing in the Finals. 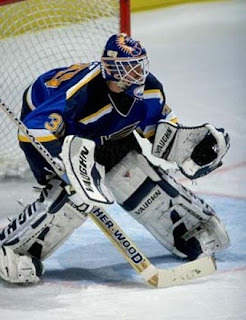 After that season, Parent went over to Germany to play for five seasons with four different teams-- the Iserlohn Roosters (2001-02, 2005-06), Kassel Huskies (2002-03), Eisbaren Berlins (2003-04), and the Hannover Scorpions (2004-05). He would retire after the 2005-06 season. Parent's toils in the minors may not be that memorable to some, but that freak injury he suffered is something that could keep him on some lists of those with a morbid state of mind. He did come away with a lot of minor league hardware, but it's nothing like the big hardware he wanted to win in the NHL. While the buzz about yesterday's announcement of the new arena being build in Seattle and how it could be a new relocation destination for struggling NHL teams, the fact remains that this deal may not fully go as planned for more the Pacific Northwestern faithful. There's still some red tape and issues that need to be cleared up in order to make this into a reality situation-- but it's hope for a city that didn't have much of a chance with an old arena. First, the positives-- it's a solid market with an already ingrained rival with the Vancouver Canucks up the road. That would help both sides go back and forth and should people in Vancouver not be able to get tickets to see some teams they might want to see-- they can just shoot down to Seattle to check them out. It's something that will create jobs for the Seattle area and bring another spectacle to the Seattle area when it comes to new stadiums-- SafeCo Field and CenturyLink Field being relatively new stadiums as well. Yet, there's still some concern when it comes to the funding, as Seattle residences are still paying for the KingDome, which has been long imploded, but still needed to be paid for. The City owns the KeyArena, which will be an issue because they wouldn't want to lose money on that if they decide to build the new arena. Not only that, but it seems that in order for the arena to start being build, the new relocated team has to be owned by someone and already moved into the KeyArena to play for a year or two because ground will be broken on the new arena. That in itself could scare away potential relocating teams, as the KeyArena is 50 years old this year and only gets some renovations here and there-- as you can bet nothing big will happen to the KeyArena for a team only staying there for the short term. For hockey alone, the building only holds 11,000-- 9,000 of them are unobstructed. Another issue would be the 30-year bond-lease that the teams would have to sign onto, which is what got the Coyotes into their mess and may create another mess if the team doesn't get the attendance they thought they would from the on-set of this project. That said, when you look at what the Phoenix Coyotes have been averaging-- 11,655-- and the league being frustrated with not having an owner still; they may put up with the low attendance for a season just to get them off their hands and have that debacle over with. Depending on how fast the crews can build an arena-- it'll be a short-term deal in the old barn before the new arena is set-up. Not only that-- what will it do to effect the WHL's Seattle Thunderbirds. While the team plays in Kent, Washington-- 30 minutes away from Seattle's downtown, it could take away from the team's attendance, which was just over 4,000 last season for the year in their 6,500-seat facility in the ShoWare Center. While Junior Hockey has a presence there, will the area be enough to hold two prominent franchises or could it be a death-blow for the junior hockey team in Seattle?? Time will tell, but you have to wonder what's going on with the Thunderbirds owners at this point with this news. While the $500-millon dollar arena project hasn't give much details, the investment group who is making this deal and their lead man in this, Washington native Chris Hansen (not that one), are keen to have a new arena. That said-- Hansen is a guy who grew up with the NBA's Supersonics and you can imagine that getting basketball back will be his top option. Many hockey fans may get excited about it, but if it's not the right terms for the team or the city-- it won't happen. While hockey has a rich heritage in Seattle-- including the first US team to win the Stanley Cup-- basketball will always be the full winter sport people will remember most about. Positivity is that there's enough people in the PacNorthwest to garner the attention and grab a pretty critical market for the NHL, one that would be a little bit more attractive than the Quebec City option, which is another city without a new arena. Whatever the outcome, the fact that there could be another option, one that the NHL would probably LOVE to have over Quebec City and Kansas City--is always good for the league and struggling owners who may want to unload their team. In a world where there's plenty of random stats that may or may not lead to looking at a player differently; I've decided to do that on my own. I was thinking last night about how bad your team is if you're getting the back-up put into the line-up to start against your team. So...why not go ahead and research it all. Of course, you have a lot of "back-ups" who are call-ups and get a start every now and again, but they still count. Call-up or not, the fact they were in the AHL and then next thing you know they're starting against your team-- it could be an issue. Yes, yes-- I know the injury bug has caught teams before-- but let's not ruin my fun...or something. That notwithstanding-- I'll horribly present you you the BUGI-- Back-Up Goalie Index. 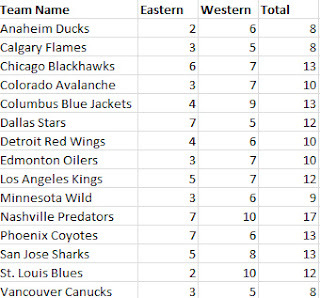 In all of this, the Eastern Conference has 22 goalies designated as back-ups, while the Western Conference only had 18. Back-ups have faced the Eastern Conference 205 times, the Western Conference 170 times. Intraconference has the Eastern Conference facing other Eastern back-ups 167 times, while Western teams face their own conference 104 times. The East has only faced Western back-ups 38 times; West faced Eastern back-ups 66 times. The Carolina Hurricanes get the most within their conference and then move overall in the conference when it comes to the back-ups. 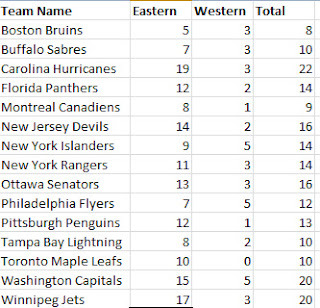 The Bruins got the least within and total in their conference. A very interesting stat is the Toronto Maple Leafs not facing a Western Conference back-up, while the Montreal Canadiens only have seen one. As you see, a lot less back-ups, no teams totaled over 20 games, while the Eastern Conference had three. Vancouver, Dallas, and surprisingly Calgary have faced the least in their division-- as Calgary's surprise could be because of Miikka Kiprusoff playing most of the time and giving them a chance to win most nights. 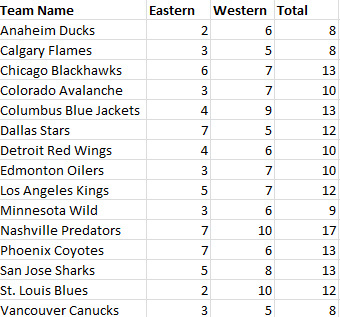 St. Louis and Anaheim have faced the least outside their conference; while the total sees Anaheim, Calgary, and Vancouver tied for least faced back-ups. In a surprise, the Nashville Predators have faced the most back-ups, despite being fifth in the Western Conference standings and tied for fifth in all of the NHL in points. I understand this will not catch on, nor should it. But it's is interesting to see which team face the most back-ups. Especially considering how bad the Blue Jackets and Islanders are-- they don't face as many back-ups as you would have thought. 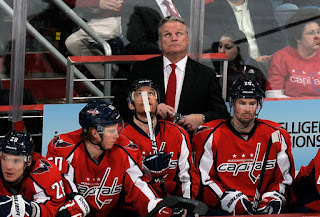 While it may be throwing the baby out with the bath water after another loss against a top tier team and their back-up (Thomas Greiss' Sharks won 5-3), you have to wonder how much time the Capitals have with Dale Hunter behind the bench and George McPhee as the GM. Sure, it's not been a good year all around and you could blame injuries, but it's proving that the Caps are not adjusting as well as many thought they would. 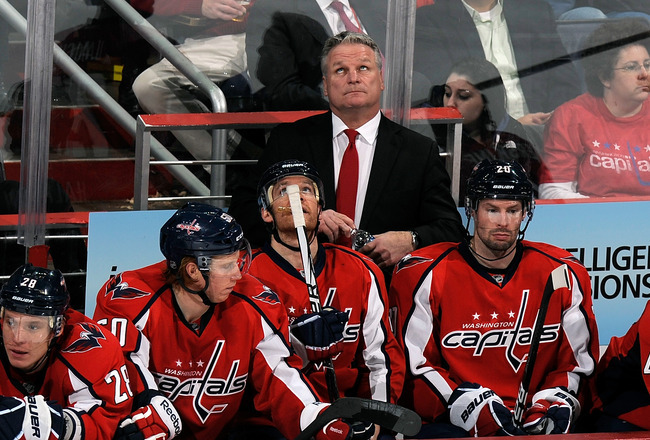 The Dale Hunter ideal is an interesting one because you have to wonder if owner Ted Leonsis will give him a full off-season to work with in order to get his schemes down and to pass along to the players. He acquired Bruce Boudreau's team and really hasn't had that much time to adjust the players to his system. If he gets a full off-season, he could be able to turn the team around. With GMGM, you have to think that he's out unless it shows that Leonsis is too loyal and too proud to actually let him go. GMGM has been through the rough times and built a winner-- even though in the playoffs-- not much came from it. He was able to get the Caps relevant again, but in an off-season where many thought McPhee stole Tomas Vokoun away from everyone-- he hasn't has much to show from it. If the Caps fail to make the playoffs, he'd be the first to go. One also has to wonder why they would throw Braden Holtby to the wolves, calling him up in the morning, waiting until he gets to Washington in the afternoon to tell him he's starting. Vokoun being sick is one thing to call him up, but is Michal Neuvirth not good enough to start back-to-back games?? That should speak volumes in confidence of the goalies right now. That said, the Caps still have about one-third of a season to go and do have a history of making late-season runs to the playoffs-- most notably the run in 2006-07, winning down the stretch to knock off the Carolina Hurricanes to win the Southeast and get into the playoffs. We'll have to see if this team has something left in them and if they get the confidence and awareness to actually show and play the last 20+ games in the season. This week's AGM could be one of the more well travelled players on this list. From all the travels in the minors to playing for the same organization in two different locations-- this week's AGM definitely was able to see North America. though his career wasn't what he could have hoped for, he did keep hacking at it when the chips seemed to be down-- including many teams folding during the season. This week, the profile of Bill Oleschuk. The Edmonton native started in the 1971-72 with the AJHL's Edmonton Maple Leafs, while playing one game in the WCJHL with the Winnipeg Jets. The 1972-73 season allowed Oleschuk to go back to Edmonton to play for the Mets, while in the 1973-74 season, he moved to Saskatchewan to play 10 games with the Prince Albert Raiders in the SJHL, then 11 games for the Swift Current Broncos of the WHL. The 1974-75 season allowed Oleschuk to play for the Lethbridge Broncos of the WCJHL for two games, then his rights sold over to the Saskatoon Blades-- playing 44 games, putting up a 24-12-5 record, then going 7-5 in the playoffs. Oleschuk got WCJHL top goaltender honors for his efforts. In the 1975 Draft, Oleschuk was drafted 110th overall by the Kansas City Scouts, where he would only play one game in the 1975-76 season for them, a loss. 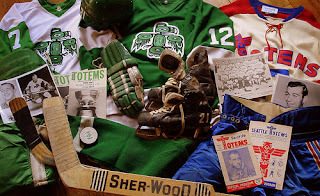 The rest of the 1975-76 season, Oleschuk played in the IHL with the Port Huron Flags for 44 games. The 1976-77 season saw Oleschuk play three games in the CHL for the Oklahoma City Blazers (0-3-0), but spent the majority of the year with the Southern League Baltimore Clippers, finishing with a 15-14-1 record for the season in 30 games, but the team folded before the season ended. When the Scouts move to Colorado to become the Rockies, Oleschuk's rights went there, too. He would only play two games with the Rockies that year, both loses. 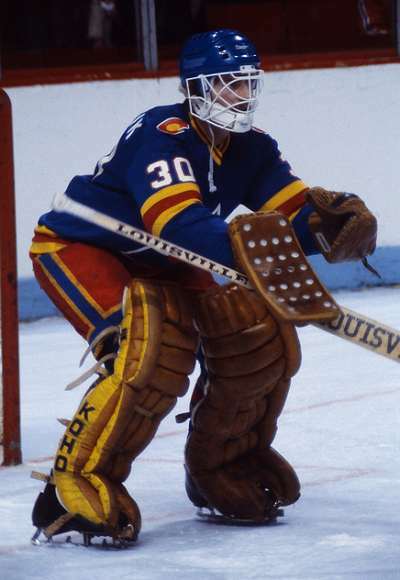 The rest of the 1977-78 season, Oleschuk bounced around the minors-- playing nine games with the CHL's Phoenix Roadrunners (2-6-1) before that team folded, 11 games with the Hampton Gulls of the AHL (1-9-1) before they folded, two games with the Philadelphia Firebirds of the AHL (0-1-0), and 13 games with the IHL's Flint Generals to end the year. The 1978-79 season was a bit more grounded for Oleschuk-- playing with the Rockies for the entire season; getting in 40 games and putting up a 6-19-8 record. Oleschuk would play 12 games for the Rockies in the 1979-80 season (1-6-2), but would spend the rest of the season with the CHL Fort Worth Texans, going 24-14-3 in 43 games. Staying in Fort Worth for the 1980-81 season, Oleschuk went 10-22-1 in 36 games. It was a short-lived 1981-82 season, as Oleschuk played only seven games all year with the CHL's Dallas Black Hawks, going 2-4-0. The 1982-83 season, Oleschuk played 29 games for the IHL's Peoria Prancers, then one game with the Fort Wayne Komets in the 1983-84 season before he would hang-up this pads for good. With all the teams folding around him, you may think of him as a kiss of death for some organzations. That said, the well-travelled goalie was able to see North America and experience every kind of setting. He got lost in the shuffle of an expansion team and one that relocated in the NHL; but was able to try and do his best with not-so-good minor league teams, too. For some reason, I follow a couple of wrestlers (because I like wrestling-- don't judge) and they've been promoting one of their comrades, Joey Ryan, to be voted into the MLB Network's Fan Cave-- where one winner and their friend inhabit this area of New York and stay there to watch all of the games the MLB puts forth and give their insight and get some players and other celebs to stop by, hang out, and basically live the dream doing not much more than what they've done as fans. 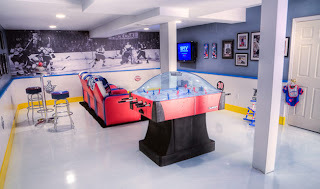 This got me thinking and I'm sure this has been put out there before-- why not have a NHL Fan Cave. Sure, it's a hack gimmick, it's stealing, but it's true. You want passion, the hockey fan does bring it. Plus, since it's an internet based ordeal-- you'll have cut-throat activity when it comes to putting their bid in and then to get their votes if they become a finalist for their Fan Cave. More over than that-- the passion that fans get on Twitter when it not only comes to supporting or bashing their own team; it'd be ten-fold when it comes to supporting or bashing other things going on in the league. Of course, that being said-- that could be the downfall of the idea. The fact that so many people can be-- for lack of a better term-- asses when it comes to some of the caveats of the sport as a whole. Considering how many people are critical of the league itself and those who run it-- putting some die-hards as commentators on the league-run network probably wouldn't be the best thing for the game as a whole. However, the fact the NHL Network doesn't have that much material when it comes to something outside of classic games and highlight shows; it would be something they should look at. They already made the "HBO 24/7" gimmick with their "NHL36" idea of following a player for 36 hours. Why not have a take off and something more fan oriented to actually draw people into it and give another dimension to the network that has the league name attached to it. Maybe another reason is that you have a lot of video bloggers out there already giving their reaction to games or decisions-- thus really making this idea a silly one. However, if you want to go that route-- why not get the collection of reactions and put that into a show?? My point is that the NHL Network should put something more than the stuff they have already, which is highlight shows and simulcasting XM Home Ice shows. Thinking outside the box and actually getting the fans more involved into the process would probably draw some more attention to the network outside of the fact that it's a place where it's nothing but hockey. And if this idea does get seen by the NHL Network.....you know, how about you give me some credit with my own show or bit or something. I'm feeding you ideas here for the love of Pete. The list for hopeful Olympic hockey nations are out for the 2014 Games in Sochi, Russia-- and boy howdy is it quite the list, male and female alike. Now, for the men's side of things-- the top-nine team in the IIHF ranks automatically qualify, while the women's side have the top-six already in. That leaves only three spots for the men's side and two spots for the women's side to get spots. So, while the list is pretty straight-forwards-- the wide array of interesting markets could be intriguing to some, especially if we get some kind of upset special in one of these qualification rounds. For the women's side-- you can bet the Asian nations of China and Japan are always up there when it comes to getting into the Olympics, but never sleep on the Germans or Kazakhs either. If you want to go really out there-- I wouldn't sleep on Hungary either. They dominated the U18's this year, boosting themselves to the top level, which could play out well for qualifications. The men's side could be a little more crazy, especially depending on how the top-nine play out. Sure, we can pretty much pencil in the top six-- yet, those 7 through 9 and the other three could get crazy-- especially in the qualifying round. The Belarussians are always hard and would want to play close to home, the Kazakhs are always a dark horse and would have the proximity motivation, but France and Denmark could also play the role of spoilers in all of this. Latvia and Slovakia are the stalwarts, too-- but you know one crazy bounce and it all changes. There's one more tournament to go, the World Championship, which will probably make or break some nation's hope for an easy in to the Olympics. Considering there's already 16 teams there, there's a lot that could get shuffled around very quickly should a slip-up happen. Still-- we're two years away and the Olympic hype is already getting started. Not much to say that hasn't been said here before-- however, this week's AGM is a guy who advanced through the NCAA ranks in a time where that wasn't the normal fashion. Hell, he even toiled in senior hockey and low minors waiting for his chance. This week, the profile of Gord McRae. McRae came onto the scene with the Michigan Tech Huskies in the 1967-68 season and would play for three years until the 1969-70 season. He totaled 71 games through his three years, helping the Huskies win the WCHA title in 1969, while putting up the best single-season save percentage in school history at .928 in the 1967-68 season, which is one that still stands today. After his three years in college, McRae moved to the Eastern Hockey League in the 1970-71 season, playing in 24 games between the Jersey Devils, Jacksonville Rockets, and Charlotte Checkers; but no record was recorded-- sans a 7-0 playoff record with the Checkers to help win the championship. The 1971-72 season had McRae bounce around all over-- starting with the Ontario Senior League's Orillia Terriers for two games, then to the AHL's Providence Reds for three games and putting up a 2-1-0 record. However, McRae would settle down with the Central League's Tulsa Oliers, playing in 17 games, finishing with a 5-5-6 record, then going 3-4 in seven playoff games. In December 1971, the Toronto Maple Leafs signed McRae to a deal, but allowed him to stay in Tulsa. 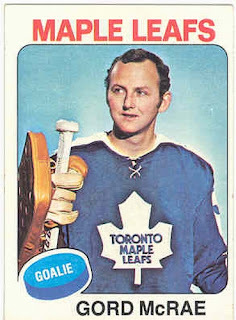 In the 1972-73 season, McRae split his time between Toronto, where he would go 7-3-0 in 11 games, and Tulsa, posting a 18-19-6 record in 42 games. McRae would stay in the Central League in the 1973-74 season, this time with the Oklahoma City Blazers, going 20-14-4 in his 39 games of action that season. The 1974-75 season saw McRae start out with the Blazers, playing in 29 games (4-16-4) before spending the rest of the season in Toronto; playing in 20 games with the Maple Leafs and finishing with a 10-3-6 record and then going 2-5 in the playoffs. McRae stayed with the Leafs in the 1975-76 season, mainly in a back-up role, finishing 6-5-2 in 20 appearances. However, the 1976-77 season, McRae only saw two games in Toronton (0-1-1), spending most of his time in the Central League with the Dallas Black Hawks, playing in 30 contests and compiling a 17-6-7 record, but only going 1-2 in three playoff appearances. Yet, McRae was still able to get the Terry Sawchuk Trophy for fewest goals-against and First-Team All-Star honors in the CHL. McRae went back to the Maple Leafs in the 1977-78 season, going 7-10-1 in 18 appearances, which would lead to his retirement after the season. Currently, he resides in Centennial, Colorado. In 2004, McRae was inducted into the Michigan Tech Sports Hall of Fame. While his minor league career is what many may remember and give him accolades for, the fact he was in the NCAA and was able to make a decent career as a back-up in Toronto despite being through obscure leagues and travels. Makes it more impressive that through those toils, he was able to make it to the show. Last night, I was opining on Twitter about how the Ottawa Senators should possibly look at getting Marty Turco into their fold, if for nothing else but to rely on him going down the stretch. 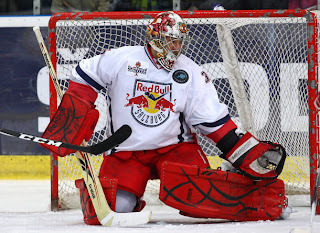 Especially after Marty Turco's solid display for his first game with Red Bull Salzburg of the Austrian League (resulting in a 4-1 win); it wouldn't be the worst idea since he has an out-clause to it. That said, odds are that if Marty Turco does sign and try to come over, he will get picked up on the waiver wire like Evgeni Nabokov did last season, but that's something that Senators might have to risk. You see, the Senators have rode Craig Anderson for the last 17 games straight. That shows that Paul MacLean really doesn't show much faith in back-up Alex Auld and that Anderson will earn his contract. That said, the surprising Sens will need more than to hope Anderson doesn't burn-out if they want to make the playoffs and really shock the world for a team that wasn't supposed to even content at all. Sure, there could be a better alternative in the trade market, and especially with the caveat of Turco having to got through the waiver wire-- it would be a risk, but if he falls through the cracks; a nice insurance policy. Turco looks like he wants to be on a contender, which is what the Senators could become with him in the line-up. The thing with Turco is that if he does get picked up on the waiver wire-- who could be the person to do it?? You could think the Columbus Blue Jackets would go after him-- but he didn't seem to willing to go there when he had the chance to. The San Jose Sharks could be a team that could get with Turco, though Thomas Greiss has played alright and Antero Niittymaki is on the outs with the franchise; though that insurance policy would be nice for a team who really needs to prove something in the playoffs. Even the Calgary Flames may want to take a shot if the price is right-- but I highly doubt it with their lack of cap space and contract space, as well. Marty Turco will be on a NHL team before the trade deadline and it's my belief that he'll play in the NHL this year. With what team is really the question. Also, if he gets picked up on waivers by a team he doesn't want to be with-- does he pull a Nabokov and not play for the season?? Does it matter to him if he can get a shot back in the NHL?? We've got about three weeks to find out if someone takes a chance and he takes a chance on them. It was 19 years ago today that Gary Bettman became the 1st and, to date, only commissioner of the the NHL. Prior to that, the leader of the sport was called the president of the league-- but either or. The fact remains that while he could be the most polarizing figure in the NHL today-- for me, he's one of the best heels the NHL has ever seen. During his 19-year tenure, Bettman has brought about six expansion teams (Florida, Anaheim, Nashville, Atlanta, Columbus, and Minnesota), seen five relocations (Dallas, Colorado, Carolina, Phoenix, and Winnipeg), and has had control of a couple teams as well (Ottawa, Phoenix, and hand in Buffalo's first transition). While he did try to force hockey into markets that purist didn't quite like, they have seemed to make a niche for themselves in their local area, albeit with some tough times having to be travelled in order to get to the successful area. Hell-- many of the "Sun Belt" teams have gotten the honor of hoisting the Stanley Cup-- Anaheim, Carolina, Dallas, Tampa Bay-- really making Bettman feel silently smug, I'm sure. More over, Bettman got the NHL to the mainstream, starting with bringing the NHL to FOX in 1995 for $155M, then going to ESPN/ABC in 1998 for $600M, then moving to the OLN/Versus/NBC Sports Network contingency first for $270.5M and more recently $2.2B over the next ten years. While the bitching will always be around that it's not enough or not seen enough by people travelling or in their own market-- but he's getting the deals done in order to put it out there-- if your cable or satellite provider doesn't have it....you may want to take it up with them. Sure, Bettman did cancel the 2004-05 season and played hardball....like his bosses the owners want....he got the salary cap the owners wanted and what they felt they needed-- although their greed really got crazy from the onset, but still-- he can't protect the owners all the damn time-- but will take their side because they are his bosses. Many point to him being a basketball guy, but who's to say that in order to run the league and listen to the people to own the teams, you have to know the game?? I bet he doesn't know all that much about basketball when he worked at the NBA. He's a lawyer and knows how to go about things and knows how to market things (right or wrong as they may be) and knows the legal game for when it comes to collective bargaining. He is the heel and takes the heel heat, and embraces the role well, taking it in stride. He has built up an astonishing amount of revenue for the league, for the owners, and the players-- because without the revenues, players wouldn't be getting the salary they would; though many debate on how much a player is worth on a player-by-player basis. 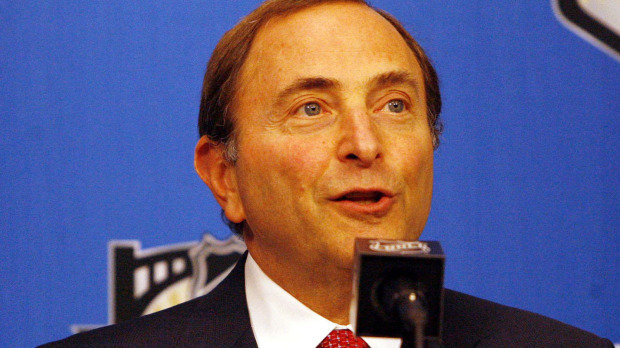 Bettman probably has a much stronger personality than anyone you could put in there. I, for one, will always be a Gary Bettman fan.....regardless of how infuriating some of the decisions he has made has made me. The personality is what turned me into a believer. 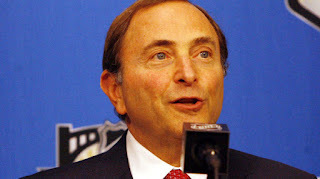 Long Live Bettman!! Hashtag-- heel.